Around the world, coral reefs are in decline. To protect these precious ecosystems, scientists must study different reef organisms and their feeding relationships in the food web. It is unknown how the feeding behavior of reef sharks affects the coral reef food web. 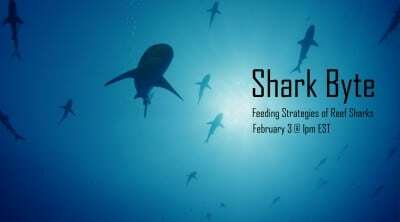 In order to understand this information, scientists must first understand the feeding behavior of sharks. On this Google Hangout on Air we talked to leading shark experts above and below the water to learn how reef sharks feed in the wild and in an aquarium setting. Meet Australian shark biologist and star of the Emmy winning film, Mysteries of the Coral Canyon, Dr. Will Robbins, to learn about reef shark feeding behavior in the wild. 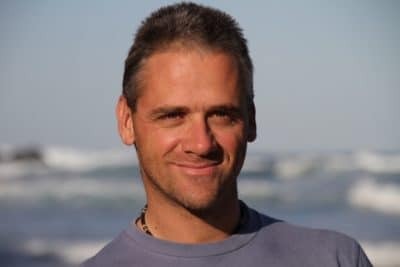 Dr. Robbins has over 20 years of experience as a research scientist and his work has lead him all over the world to places like South Africa, New Caledonia, Great Barrier Reef, Papua New Guinea, and the Seychelles. Will is also the Founder of Wildlife Marine, an organization that independently investigates contemporary marine conservation issues. Visit the underwater world of the Blacktip Reef Shark Exhibit at the National Aquarium with Curator of Fishes, Holly Bourbon. 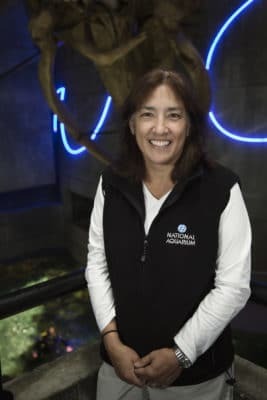 Holly has spent 30 years working with animals and she joined the National Aquarium in 2012. Her favorite animal is a shark and she enjoys educating guests at the aquarium about these often misunderstood, yet beautiful creatures.